MIDTOWN, Manhattan (WABC) -- Supporters of New York Knicks legend Charles Oakley gathered Sunday after he was kicked out and banned from Madison Square Garden. Brooklyn Borough President Eric Adams and the Coalition of Professional Black Men headed to the Joe Louis Plaza outside the Garden in Midtown, denouncing Knicks owner James Dolan's treatment of Oakley. They are demanding Dolan immediately lift the ban on Oakley from visiting MSG. Oakley is facing assault charges after a run-in with security guards at the Garden. Adams and others criticized Dolan's behavior and handling of the encounter. In an interview with ESPN Radio, Dolan said Oakley used racial and sexual overtones and that games must remain safe for fans, so he was enforcing the ban. 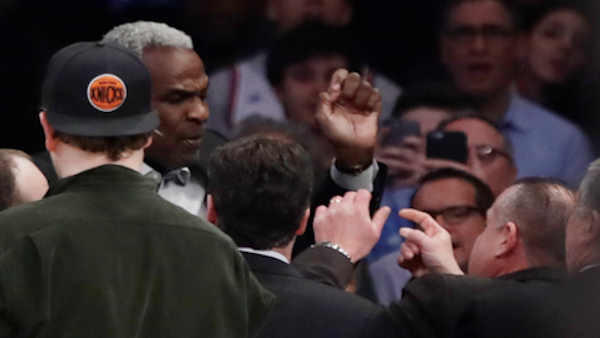 The Knicks have been criticized by current and former NBA players, as well as some of their fans, for the treatment of Oakley during the game that was televised nationally on ESPN. "He should be up there being recognized because the fans do love him," Dolan said. "But this behavior just doesn't work with that." "That was just a situation where the person didn't work out and this was probably the last straw," Dolan said. "We're obviously looking at everything that we did here along the way and what happened, and that's one of the casualties."